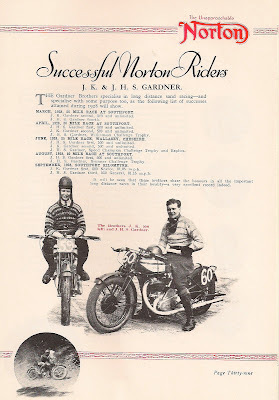 -SG- The 1929 Norton brochure devotes a whole page to the Gardner brothers - J H S and J K - and their successful exploits on the sands at Southport. The relevant page is presented above and it is worth remarking that they were singled out for this treatment and must therefore have been highly regarded by, or even personally known to, the Norton management. Just who were they? The answer is that they – like Tim Hunt - came from a moneyed Lancashire industrial background as scions of the important Gardner Diesel Engine family. Indeed JHS went on to become Joint Managing Director of the concern, a position he held through into the sixties. By co-incidence, while searching for another entry in the relevant despatch book microfilm, I recently came across the entries for the two CS1s which they bought in March 1928. These were not works replicas as such but none the less various extras or deviations from standard were listed. First, there is the intriguing heading ‘Mr Moore’s alterations’ Then, more specific variations, such as TT Mudguards, toolbox on chain stay, 3 Gallon tank, extra sprockets, light flywheels, HC piston for RD1 (ie alcohol fuel) fitted, spare standard piston, 1 3/16 x ?? (illegible) gauge valve springs and 1 3/32 Binks carburettor. Incidentally, I draw the conclusion that the size of the carburettors was shown specifically as an indication that the normal Binks fitted to CS1s was smaller and indeed Binks carbs. I have owned in the past have been closer to 1 1/16 bore. 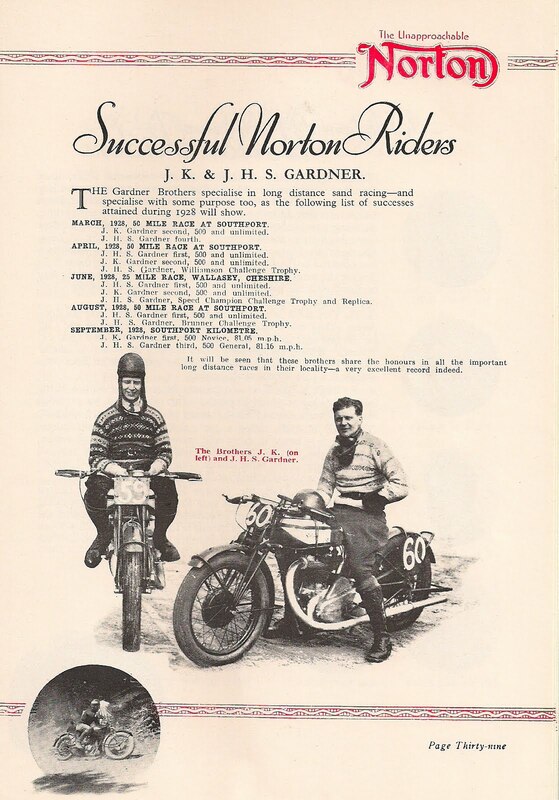 That the Gardners were treated as ‘a special case’ by Nortons is also confirmed by the fact that their bikes were supplied direct rather than through a dealer. And their 1928 results show that they put their machines to good use! But there’s more to this story than that and the ensuing details are, in my view, of equal or perhaps greater importance. In late September 1929 the despatch books reveal that Nortons loaned JHS Gardner a racing CS1 engine and against it in the records it states: 'New tangentical head JHS Gardner TT engine for RD1. Raised ports' It is clear that the engine remained Norton property and was later returned to the works, as it was ultimately fitted to a complete machine despatched ‘On Loan’ to Laytons Oxford in March 1931. 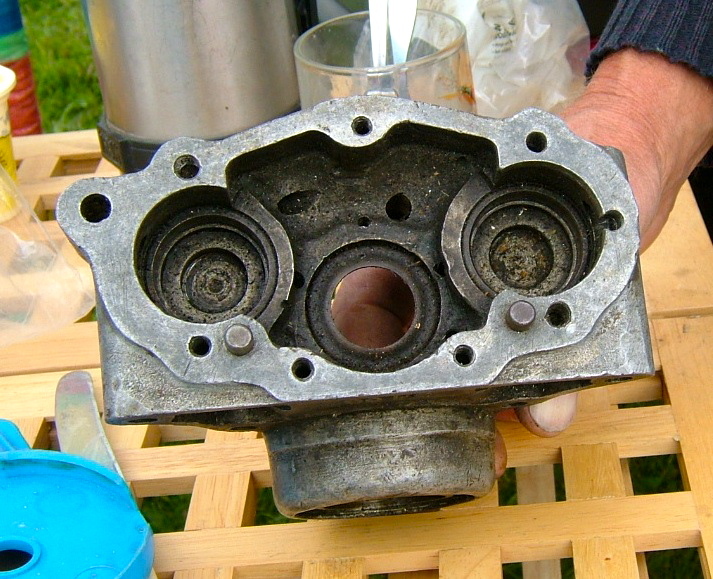 Apart from the rather tantalising reference to the ‘raised ports and new tangentical (I think tangential was the word intended) head', and the fact that a piston was fitted for use with RD1 fuel, one is left to ponder what else was special about it. And by a great stroke of luck, we now know, as the engine concerned has turned up (pics above) - somewhat the worse for wear and neglect and not quite complete but basically all there. Better still it now belongs to a CS1-owning friend of mine who has kindly allowed me to photograph the key differences between it and the same as 'you could buy version'. The photos clearly exhibit my lack of photographic expertise and poor choice of background but just about serve their purpose. They follow, along with a brief description. Bottom end: Crankcases appear externally to be regular CS1 items as do the flywheels. 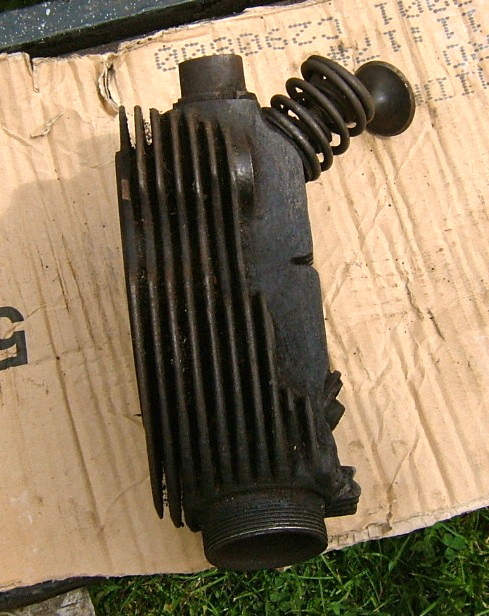 A 5/8 pin con rod of what appears to be usual CS1 type is fitted. 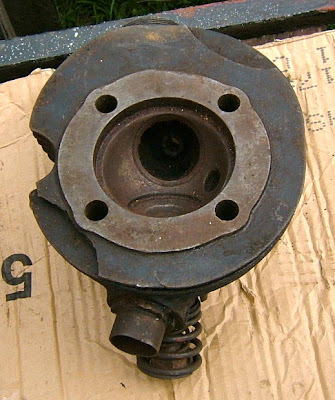 However there is no oil level adjuster on the timing cover, a simple internal pipe arrangement to the back of the crankcase provides a fixed crankcase oil level. 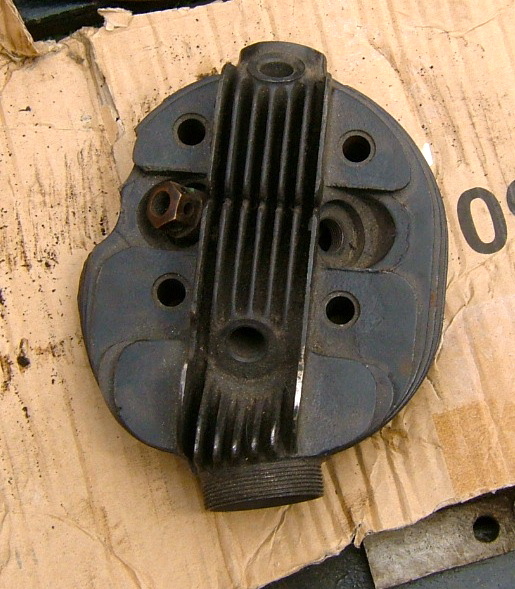 Oil scrapers - not integral but attached by screws - are also incorporated in the rear of the crankcase. 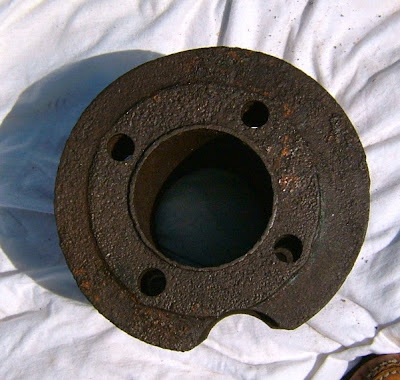 Oil unions are of a larger size than standard. Further, the oil pump runs at 1 1/2 times normal speed as a result of changes to the sizes of the driving worm and the bronze gear on the oil pump spindle. Barrel: Has nine fins instead of the usual ten and the spigot on the top is far larger and deeper than standard – but not the same as that which appeared in 1931. The base of the barrel flange incorporates an annular groove with six holes leading through to the bore. The groove - rather like later Inter designs - is fed from the drilled upper rear crankcase pinch bolt, which in turn incorporates a needle valve and banjo oil union. It is not clear from which point the oil feed to the crankcase pinch bolt/union was taken but possibly from the missing cam box cover. Head: Inlet port is angled to the right but the inlet stub is the same size as normal. Exhaust port is also angled to the right. Valves appear to be same size as normal. Head has ten horizontal fins – two more than normal – and embodies a deep recess to accept the larger spigot on the barrel. Two bolt holes are on either side of the vertical fins, towards the front of the head, perhaps for a head steady. Head and barrel are secured by orthodox full length through studs rather than the two piece versions used on standard CS1s. Cambox: This is missing the end cover but differs substantially to the regular type. 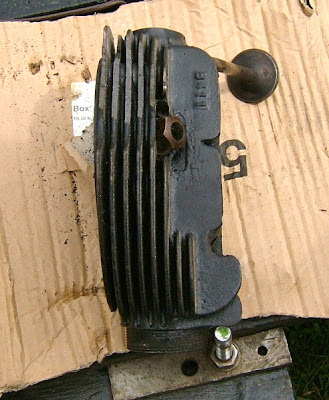 The cam shaft has two detachable cams on it pegged together as with the later Carroll engines. 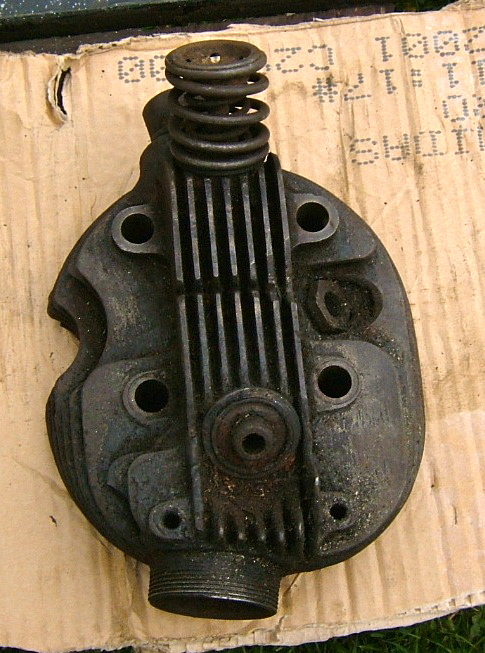 The cams, while similar to the later Carroll type, have no oil holes and have a unique number. 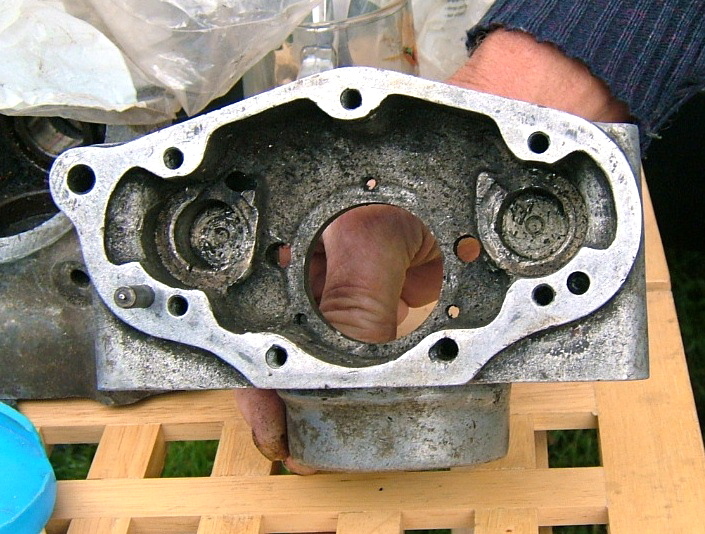 The outer end of the cam shaft would appear to have run in a ball race or roller race rather than the usual bronze bush. 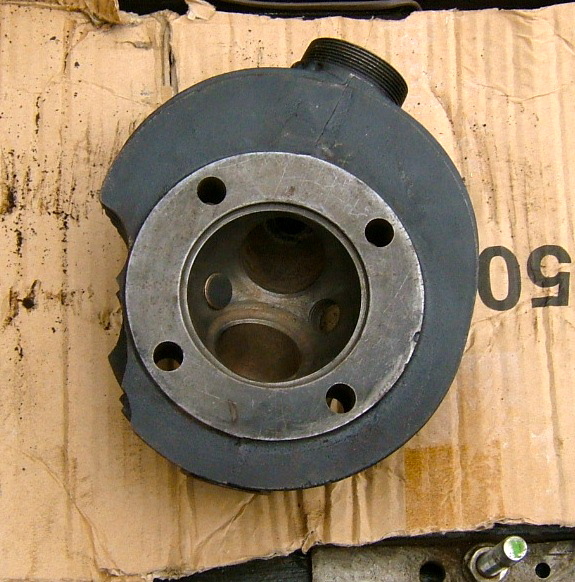 The cam follower spindles – usually running in bronze bushes – run in roller bearings. The need to incorporate these has resulted in a different cam box casting – and (missing) end cover. End view of standard cam-box showing counter bores for cam follower spindle bushes. End view of Gardner cam-box showing roller race outers in place of bushes and casting differences. Top view of standard CS1 head showing left hand exhaust port and straight inlet port. Top view of Gardner head showing right hand exhaust port, no supplementary plug hole and two threaded holes, either side of the vertical fins, perhaps for a head steady arrangement (seemingly unused) . Side view of standard CS1 head (some fin damage evident!) showing eight fins. Side view of Gardner head showing ten fins. Underside of standard CS1 head showing seal face and usual small spigot recess. 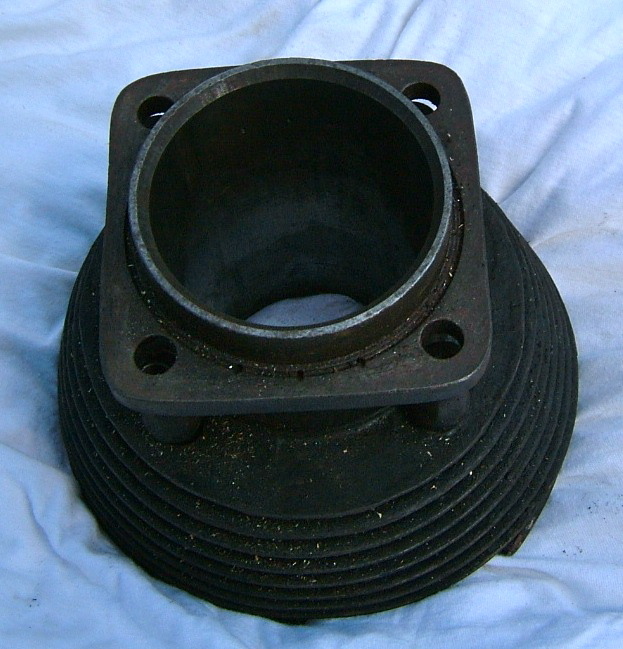 Underside of Gardner head showing seal face, much larger/deeper spigot recess and right hand angled inlet port. Top of standard (a touch rusty) CS1 barrel showing small spigot. The barrel has ten fins. Top of Gardner barrel showing much larger spigot. Barrel has nine fins. 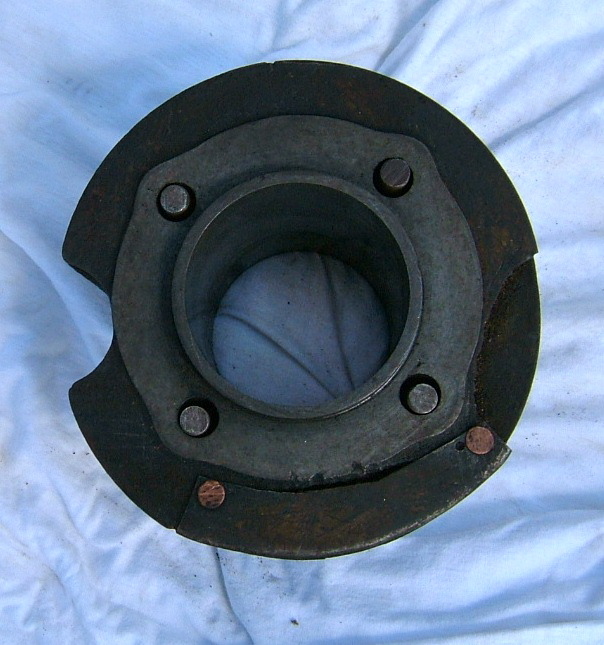 Underside of Gardner barrel showing – just about visible – the annular groove for barrel lubrication. As made, the position of the holes which lead through to the inner barrel face would seem to be 90 degrees out as the oil enters the barrel adjacent to the gudgeon pin rather than on the thrust faces. Reverting to Joe Craig’s comments on the CS1 problems in the late twenties – see blog entry of 5 July 2010 – it may be that this particular engine embodies the solutions to the overheating problems he related, solutions which ensured second and third places in the 1929 Ulster and which partially formed the basis of the Carroll engines which followed just a few months later.